Stutz wins at Old Orchard Beach. Dave Lewis who went on to a sucessful racing career is seen on this postcard after winning the 100 miler on the beach. This was the first production year for Stutz with their famous Bearcat, which shared the same chassis as this racer. The factory race cars had the radiator and engine set back about ten inches, which was the only change. They were a husky 389 CI T-head four and did quite well in racing while the factory teams participated in the big races for several years. This entry was posted in Auto photos 1885 - 1920, Auto Racing 1894 - 1942. Does any one have entry lists for the Old Orchard Beach races? My 1911 SPO Raceabout raced there with someone named Dean Gans (or Gahs). Are there any photos out there? I have results for the 1910, ’11 and ’12 Old Orchard Beach races but there is no recording of the gentleman’s name you mentioned. However, an S.P.O. 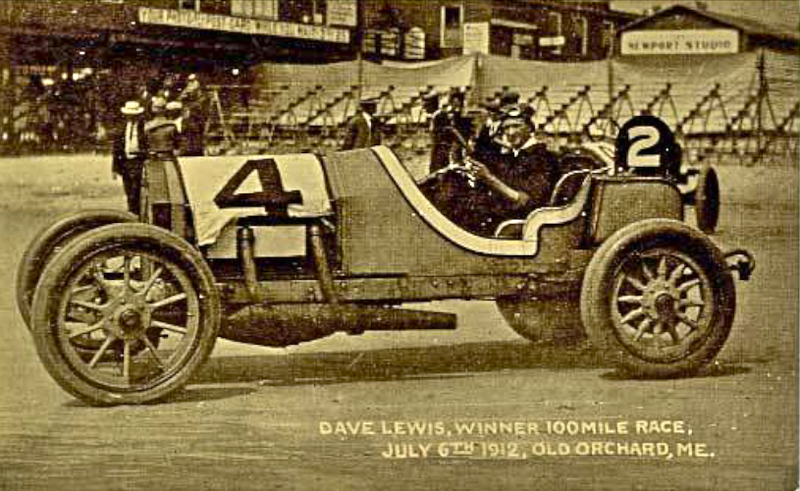 driven by Howard Plimpton finished 3rd in a 50 Mile race at Old Orchard Beach on July 5th, 1912. I also have Hungarian racer Jean Juhasz finishing 3rd at Brighton Beach, NY. on the 4th July, 1911. Infact i have him racing an S.P.O. at a handfull of races from 1908 including his wreck in the Light Car Race at Savannah 1908. My list is relatively old but if you are interested i suggest you purchase a copy of ‘The Record Book’ from Racemaker Press. Correction: The book i was refering to is titled ‘The Winners Book’ from RACEMAKER Press. Looks like Stutz had a handle on expansion chambers quite sometime before Kawasaki and Yamaha!